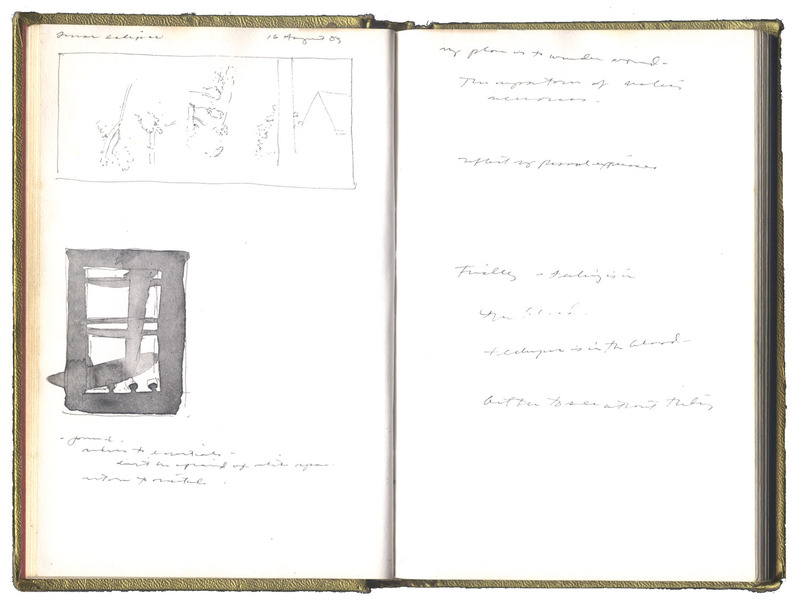 I was digging through my boxes when I stumbled upon a bit of drawing; a rectangular scrap about three inches wide and one inch tall. I turned the small fragment over and rotated it in various directions. The image, although unrecognizable, was highly finished, well-worked with black watercolor and clearly a torn from another drawing. I turned it around again and suddenly recognized it as a section I tore from a small piece entitled Tomatoes; a work that left my studio several years ago. 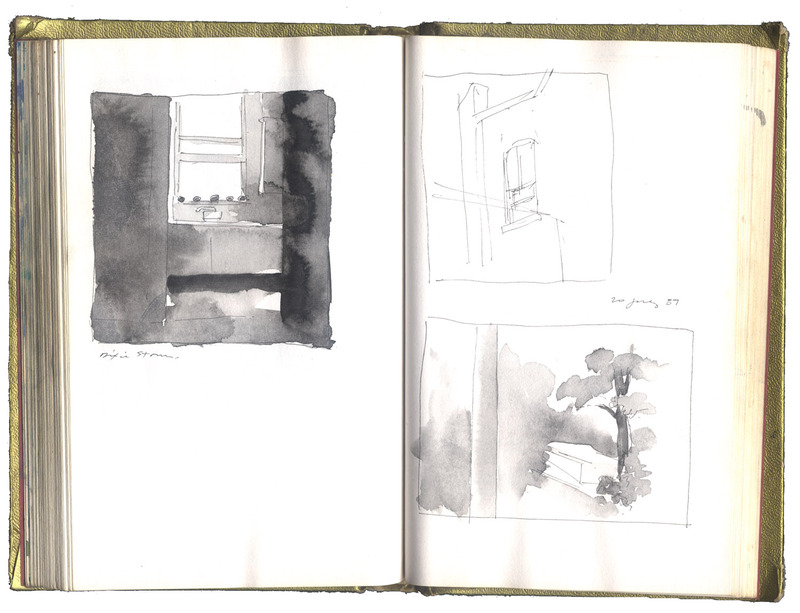 Looking through my journals of 1989, the period when Tomatoes was completed, studies show my attention telescoping towards the kitchen window as a subject (see the sequence of pen and watercolor sketchbook pages below). Eventually peripheral elements are discarded in favor of the tomatoes resting on the sill. 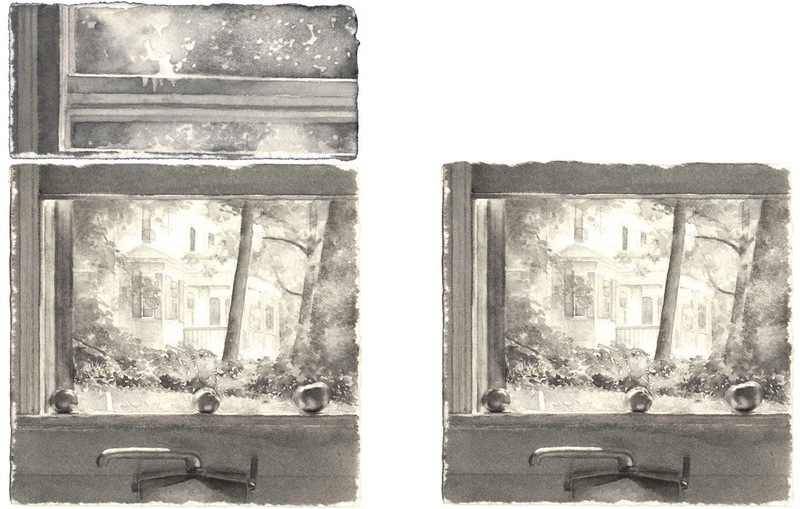 At the same time, details of the landscape outside the window emerge as a counterbalancing feature of interest. 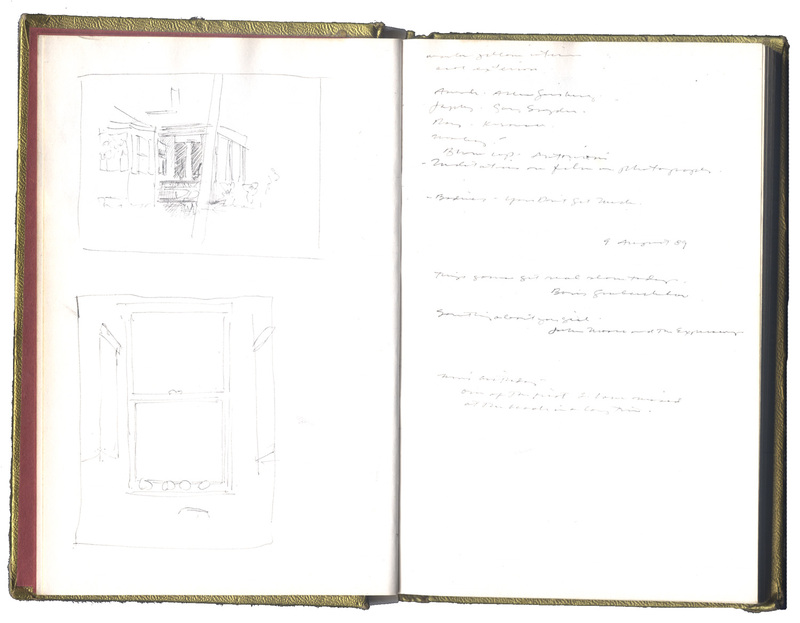 But the elimination process was never completely worked out in sketches. The final composition did not arrive until I tore the upper inch of the drawing off; removing a bit of window and trees from the finished work. Above left I have replaced the fragment in the position it occupied before being torn away. Above right is the final drawing with the upper section removed. This is just one of the more dramatic ways a composition becomes resolved. This is also a reason I prefer working on a paper support to canvas or panel. Paper tears. It is versatile. It is immediate. I also like the element of risk; it is hard to return to the original composition after it is gone. Note: The subject of Tomatoes is unusual for me; the image does not depict my home. For a period I had access to a Victorian house and I tried the new setting as a challenge. See: Tomatoes, 1989, watercolor graphite, and pen and ink on Fabriano paper, 3 x 3″, private collection.